There are times when you are watching a movie and it gradually dawns on you that you are watching something truly, truly spectacular. It must be similar to witnessing a miracle (one of the ones you gotta witness in order to be made a saint). This is one of those movies. It is audaciously, tortuously original and breathtaking in the size of its cojones. This movie is all about people who actually exist. Some of them are played by themselves (John Malkovich, John Cusak, Katherine Keener, Jonze himself), some of them are played by actors (Nicolas Cage as Charlie Kauffman, Meryl Streep as Susan Orlean, Chris Cooper as John Laroche, etc. ), and some don't exist at all in the real world. The film claims at the beginning to be based on Susan Orlean's book The Orchid Thief, and indeed it does have a lot to do with that book. There are many scenes from the book that are shown in this film. But that's now what this film is about. This film is about Charlie Kaufman trying to adapt that book into a screenplay and failing miserably at it and everythign else in his life. As such it is, like Being John Malkovich, at times on the verge of being horribly depressing, but the undercurrent of dark humor is so strong that it makes you laught the worse things get without ever being unsympathetic to the characters. 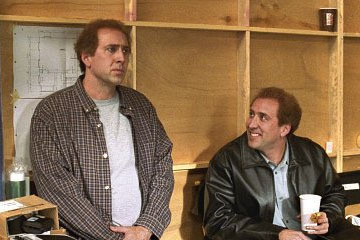 Nicolas Cage has come back to the light after a string of crappy action flicks, and has once again been nominated for an Oscar for his double role as twins Charlie and Donald Kaufman. Both performances are completely fearless and harken back to his Raising Arizona days of playing fascinating and sympathetic losers. He hunches his back and shifts his eyes and twitches subtly as horrifyingly neurotic Charlie, and carelessly flops his arms around and bobs his head and grins like a dope as the carefree Donald. Chris Cooper has the role of a lifetime playing a man who everybody describes as "such a fun character" when talking about the real person. And he is quite a character, with missing teeth and a carefree, blindly running straight ahead persona. At the same time, though, there is anger and deep sorrow bristling behind his redneck mustache. And Meryl Streep plays a hoity-toity New York art scene chilly woman who finds herself being strangely drawn to this man who has not a pretention in the world. I really can't say much more about the film without giving stuff away, and this movie works because of its surprises. I will say this, though: To truly understand what happens in this movie you have to remember that the screenplay is credited to Charlie AND Donald Kaufman. I really, really can't see how I'm going to like any 2002 movie better than this one. This will probably be right near the top of my favorite films of the decade. But it's early yet, so I reserve the right to change my mind.